The horrible institution of central banking gives the central bank incredible destructive power. While in this Keynesian age it is generally believed that this power can be used to aid an economy, the marginalized Austrian School of economics proved through unassailable logic long ago that the use of this power eventually results in ruin. The Chinese nation has moved in the direction of this ruin this week. 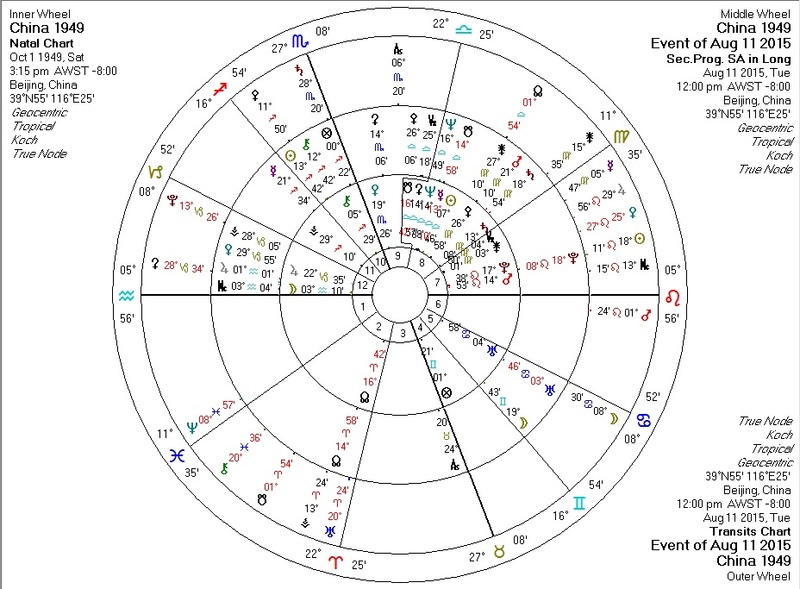 Transits and progressions against the current national chart for China give us some insight. Transiting Pluto sesquiquadrate China Pallas and square Pallas ruler Mercury: ethics tested, compromised, or obviated. On this blog we've seen this type of transit accompany basically every significant instance of wrongdoing we've looked at. And we've looked at many. Transitng Saturn at China MC: authority, restriction, public malaise, etc. Progressed Venus conjunct progressed Jupiter in the Twelfth House: money inflating and value disappearing. Transiting Neptune at Second House cusp: this is the transit that (arguably) launched Japan's "lost decade". Which, more than a decade later, has not ended. One hopes for the sake of the Chinese people that China does not follow suit. Central banking: enriching the powerful, empowering the insane, and killing the poor for centuries.